Home » Self Development » What are Your 60000 Thoughts a Day Creating Today? So what are your 60000 thoughts a day create? Your 60000 thoughts a day create your reality. This is a simple truth known by all people involved on the spiritual path. It is one of the most taught universal principles in the personal development field. Yet it is one of the most misunderstood! People practice visualization, affirmations, they use hypnosis, subliminal programming or countless other tools to transform their lives. However, they fail to recognize one key area in their lives that hinder these wonderful techniques from being effective. They sit day after day visualizing their perfect scene and yet nothing happens. Why? They have followed all the instructions to the letter! And they have chanted and imagined! They have formed a colorful, vibrant scene in their minds and affirmed that this is their reality. Then all of a sudden things get worse! What is going on? Would you like to know the secret? Do you want to know why these people get no results? Would you like to hear one powerful statement that explains everything? Yes? Good. I will tell you why these people get no results or even opposite results to those they are aiming for – simply because of the following truth. Consciously controlled thoughts such as visualizations do not materialize – ALL thoughts materialize!!! Most people believe that if they visualize for 10 minutes a day, their lives will magically transform. This is not the case. You must change your core thinking. You think approx 60,000 thoughts a day. How many of those thoughts are working against your ten-minute visualization? 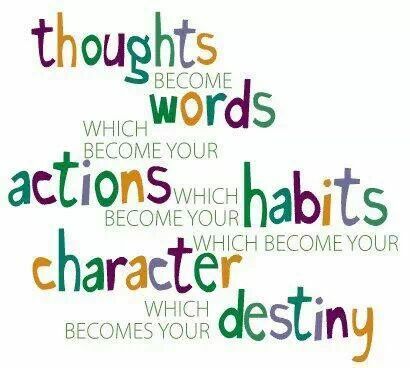 The thoughts that you follow and give the energy to become more dominant than the thoughts you discard. Your subconscious mind records these as your dominant picture on the issue at hand. You then move towards this picture because your subconscious mind starts making your outside world reflect the picture that you have stored internally. Your mind should be on whatever you want. The picture you need to have is a positive vision of you already having achieved your goal. To realize this vision, you need to focus and concentrate. Remember thoughts are real, they create your reality. Let’s say you have been visualizing a new house. You spend your ten minutes in meditation picturing yourself living in your dream home. You finish your session and get up feeling positive that you will achieve your goal. Then during the day you get a heating bill through the mail and exclaim, “Oh no, look how expensive this is, I cannot afford to heat this house”. Where is your focus in the present moment? What are you affirming? You are telling your subconscious mind that you cannot deal with what you have. You are affirming that your life is not how you want it to be. If you knew without doubt that within a week you would be moving to your new home would you honestly be worried about a heating bill? Perhaps other doubts creep in like “I should be happy with what I have”, or “I will never get this house looking the way I want it” and so on and so on. These thoughts that are not aligned with your goal. You are not giving complete attention to what you want. While you are dealing with these other lines of thought, your attention is not on your goal. If you are aware of your thoughts you will suddenly realize that you have spent much more energy on counter productive thoughts than on creating a dominant picture of the goal you want. Point your focus in the direction of you’re the life you want. Think about what you want, NOT what you don’t want. It’s that simple. Your focus determines your reality. Change your focus, and you change your life.